apologies in advance, this is a bugger to photograph. my digi slr has a tough time with reds at the best of times and it's completely refusing to play ball with this. so crappy cameraphone pics it is, i'm afraid. you can take it as read that it looks 100 times better in real life. there's no denying the economy of this pattern. a single 50g ball of 4 ply has got me more than half way up the back, so i'm hopeful that the whole thing (short sleeved cardi) will come in at under 250g. but the needles are indeed pretty small (old school 10s and 12s) and it's a lesson in patience. i'm finding this project utterly compelling at the moment, although speak to me again come the second front and the novelty may have worn off. it's a forties pattern i picked up on ebay (copy), i'm guessing from stitchcraft magazine. it's pushing the limits of my knitting skillz, e.g. 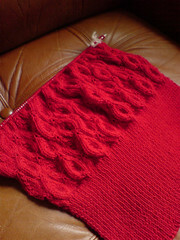 working out how to work the increases in pattern, and the pattern is just complicated enough to hold the attention. there's been a fair bit of ripping back which the yarn (debbie bliss rialto) has taken very well, and it's a soft n squishy pleasure to work.